It may have seemed like an odd sight to a stranger, but not a single eyelid was batted by the Belfast Celts coming and going from the new museum, as Jim Short took in the sights and sounds of Paradise. Travelling all the way from London to check out the new repository, Jim circled the exhibits complete with his travel bag in tow, as he made his way directly from Heathrow Airport to honour the memory of the Grand Old Team. 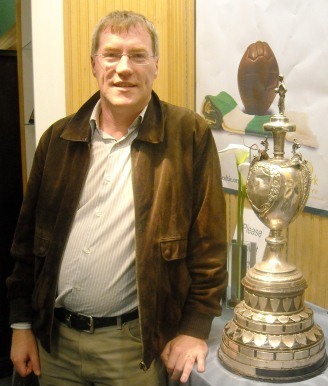 Pictured here with the Irish Cup, returned immigrant Jim was spellbound by the museum and took the opportunity to gather photographs and merchandise from the Society. Now based in England with his family, Jim explained what Belfast Celtic means to him; “Like a lot of people who never saw Belfast Celtic play, I feel a strong link to the club. Jim’s father was a well known face around Celtic Park and in Belfast in general. Originally from the Beechmount area, a stone’s throw from Celtic Park, Eddie worked for Bushmills Distillers, despite never touching a drop of the devil’s buttermilk. He also worked the spotlight at the Grand Opera House in Great Victoria Street for many years, turning the limelight on some of the most famous names in showbiz at that time, including Laurel and Hardy. In the years after Celtic’s demise, Eddie was fond of the greyhounds and during the late 1960’s and early 1970’s he trained several winning gods that rushed the cinders on the Donegall Road track and Jim has clear recollections of cheering the dogs across the finish line at Paradise. But Jim has his own particular memories of a famous Belfast Celt who has left a lasting connection with the museum at the Park Centre, as he recalled; “On one of my trips over to Glasgow back then, Paddy Bonnar travelled with our supporters club to a game. I had bought Mark Tuohy’s book Belfast Celtic not long before this and took it with me all the way to Glasgow and back so I could get Paddy’s autograph. This remains one of my prized possessions. It wasn’t any old scribble but a very clearly written message, ‘With best wishes, Paddy Bonnar.’ With great modesty, he thanked me very much for asking him to sign my book." How fitting it was that Jim would get to see Paddy Bonnar’s jersey hanging in the museum, his memory alive and well long after he passed away, after a tragic car accident in 1991. And for Jim, his trip with planes, games and automobiles was entirely worthwhile!